Sinn Féin says Michael Noonan is ‘feigning outrage’ at bankers pay, but doing little to encourage staff to take pay cuts. 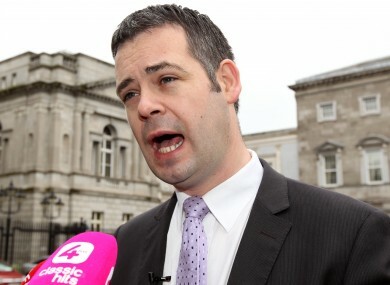 Pearse Doherty says Michael Noonan has adopted a 'Pontius Pilate' stance on bankers' pay. OVER 1,200 STAFF at Allied Irish Banks – which is 99.8 per cent owned by the taxpayer – are being paid annual packages including salaries and pensions of six figures, new data reveals. Data published by Michael Noonan reveals that a total of 1,262 staff at the bank, which has received almost €20 billion in State aid, are earning overall remuneration – including pensions and salaries – of over €100,000 per year. The figures include 103 people earning over €200,000 a year, and ten staff whose annual packages are over €400,000. Figures provided in parallel showed that 56 staff received salaries of over €200,000, as of last December, but that this was expected to fall to 37 by the end of 2012. In his parliamentary reply to Sinn Féin’s Sandra McLellan, Noonan said AIB had recognised “the absolute requirement to reduce staff costs across all areas of the business” as it tried to provide value for its owners. He said the bank had reduced pay and benefits of high earners by up to 15 per cent, and had closed its defined pension scheme to new entrants. The bank has previously announced plans to reduce staff numbers by 2,500 by 2014, with Noonan saying this programme would likely concentrate on high earners as older staff were more likely to take up a voluntary redundancy. Sinn Féin’s finance spokesman Pearse Doherty expressed frustration at the pace of change, hwoever. “It is my understanding that the minister has not written to the management of either bank asking for voluntary reductions in the excessive salaries of any of these 165 individuals,” he said, referring to the 165 staff at Bank of Ireland and AIB earning over €200,000 per year. “In response to my questions today the minister expressed what can only be described as fake outrage. Despite all his bluster he is adopting a Pontius Pilate approach to excessive bankers pay,” Doherty insisted. Email “Bankers' pay: 1,262 staff at AIB earning six-figure packages”. Feedback on “Bankers' pay: 1,262 staff at AIB earning six-figure packages”.